Die Sabbati, videlicet, 30 die Aprilis. E. of Lindsey to bring in his Commission of Lieutenancy, and attend the House. Dr. Jackson's Examination in Lady Hastings's Cause against Mr. Poulton. None of the King's or Queen's Servants entitled to Privilege, except those in Ordinary. Message from the King, for Hull to be put into His Hands, and Sir John Hotham, &c. punished. Second Letter from the King to the Lord Keeper. Message from the King, about the Settlement of the Militia. These Two Messages to be communicated to the H. C. at a Conference. Committee to confer with a Committee of the H. C. what should be done concerning these Messages from the King. E. of Sussex quieted in his Possession of Walfleet River, and Burham Water in Essex. Mr. Walsh, Queen's Servant, released. Mayor, &c. of Colchester versus Freshfeild. Roseby to attend, about his building a House on the King's Ground, near the Parliament Record Room, contrary to Order. Ld. Capell Leave to be absent. Committee to prepare an Order, for the Sheriff of Berks to suppress the Riots in Windsor Forest. Message from the H. C. for Committees to meet about the King's Message. For putting the Ordinance, for settling the Militia, in Execution. For an Order to enable the Sea Adventurers for Ireland to subscribe Money. Committee on the King's Messages to meet, and their Power enlarged. 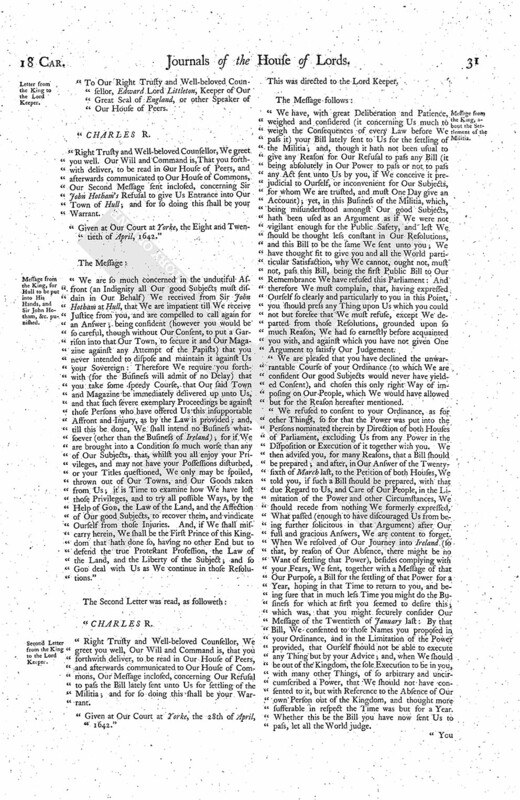 Ordinance for settling the Militia to be put in Execution. Committee to consider of an Order for the Sea Adventurers for Ireland to subscribe Money. Examinations of Rebels in Ireland, and Letters from thence. Witnesses to be examined, concerning Colonel Beeling. L. Morley's Trial, for the Murder of Capt. Clarke. Order for the Sea Adventurers for Ireland. Message to the H. C. for their Concurrence in it. Message from the H. C. that the Kentish Petition was presented to them To-day. For which they committed Sir William Butler and Captain Lovelace. And for the Concurrence of the Lords to an Order for Hull. Sir William Butler and Captain Lovelace to be examined. Bruton and Sir John Lenthall in Error. Hugh Reeves to quit his House at Ampthill. Message from the H. C. that they agree to the Orders for the Sea Adventurers for Ireland; and for Hull. And for a Conference about a Declaration to be sent to Yorkshire, touching the raising the Trained Bands there. Order for the Adventurers for Ireland additional Forces by Sea. 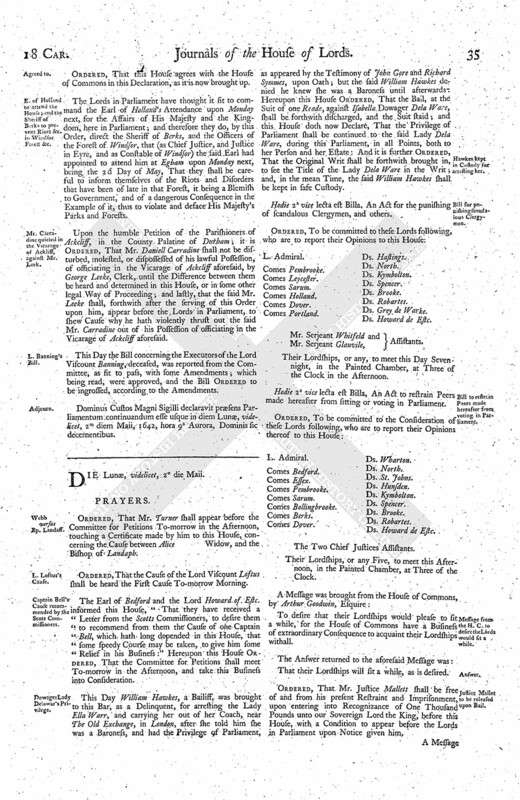 Order for appointing the Succession to the Government of Hull. Conference about the Declaration against raising the Trained Bands in Yorkshire reported. E. of Holland to attend the House; and the Sheriff of Berks to prevent Riots &c. in Windsor Forest &c.
Mr. Carradine quieted in the Vicarage of Ackliff, against Mr. Leek. Hodie 2a vice lecta est Billa, An Act for the enabling of Sir Robert Coke, Knight, to pay his Debts, and make some further competent Provision for Dame Theophila his now Wife. Their Lordships, or any Five of them, to meet on Monday next, at Two of the Clock in the Afternoon, in the Painted Chamber. The Lord Robartes reported, "That the Committee for the Bill to enable the Earl of Arrundle to sell Lands, for the Payment of Monies to the Executors of the Lord Viscount Banning, have considered of the same, and have thought fit [ (fn. 2) to offer] to their Lordships Consideration some Amendments, which are agreed upon by both Sides." The said Amendments and Alterations were read Thrice, and agreed to; and it is Ordered, That the said Bill shall be ingrossed, with the said Amendments and Alterations. Ordered, That the Lord Great Chamberlain shall be sent to, to return his Commission of Lieutenancy into this House forthwith; and that his Lordship return, and give his Attendance on this House, according to the Time he had limited him by this House. Ordered, That the Report of the Barons of the Court of Exchequer, touching Business referred to them concerning Doctor Featly and Kirwin, shall be considered of on Monday next. Ordered, That there shall be forthwith Publication of the Examination of Doctor Jackson, concerning the Lady Hastings's Cause, against Mr. Poulton. It is this Day Declared by this House, That none of the King's, Queen's, or Prince's Servants shall be allowed the Privileges of Parliament, but such as are Servants in Ordinary. "To Our Right Trusty and Well-beloved Counsellor, Edward Lord Littleton, Keeper of Our Great Seal of England, or other Speaker of Our House of Peers. "Right Trusty and Well-beloved Counsellor, We greet you well. Our Will and Command is, That you forthwith deliver, to be read in Our House of Peers, and afterwards communicated to Our House of Commons, Our Second Message sent inclosed, concerning Sir John Hotham's Refusal to give Us Entrance into Our Town of Hull; and for so doing this shall be your Warrant. "Given at Our Court at Yorke, the Eight and Twentieth of April, 1642." "We are so much concerned in the undutiful Asfront (an Indignity all Our good Subjects must disdain in Our Behalf) We received from Sir John Hotham at Hull, that We are impatient till We receive Justice from you, and are compelled to call again for an Answer; being confident (however you would be so careful, though without Our Consent, to put a Garrison into that Our Town, to secure it and Our Magazine against any Attempt of the Papists) that you never intended to dispose and maintain it against Us your Sovereign: Therefore We require you forthwith (for the Business will admit of no Delay) that you take some speedy Course, that Our said Town and Magazine be immediately delivered up unto Us, and that such severe exemplary Proceedings be against those Persons who have offered Us this insupportable Affront and Injury, as by the Law is provided; and, till this be done, We shall intend no Business whatsoever (other than the Business of Ireland); for if We are brought into a Condition so much worse than any of Our Subjects, that, whilst you all enjoy your Privileges, and may not have your Possessions disturbed, or your Titles questioned, We only may be spoiled, thrown out of Our Towns, and Our Goods taken from Us; it is Time to examine how We have lost those Privileges, and to try all possible Ways, by the Help of God, the Law of the Land, and the Affection of Our good Subjects, to recover them, and vindicate Ourself from those Injuries. And, if We shall miscarry herein, We shall be the First Prince of this Kingdom that hath done so, having no other End but to defend the true Protestant Profession, the Law of the Land, and the Liberty of the Subject; and so God deal with Us as We continue in those Resolutions." "Right Trusty and Well-beloved Counsellor, We greet you well, Our Will and Command is, that you forthwith deliver, to be read in Our House of Peers, and afterwards communicated to Our House of Commons, Our Message inclosed, concerning Our Refusal to pass the Bill lately sent unto Us for settling of the Militia; and for so doing this shall be your Warrant. "Given at Our Court at Yorke, the 28th of April, 1642." This was directed to the Lord Keeper. "We have, with great Deliberation and Patience, weighed and considered (it concerning Us much to weigh the Consequences of every Law before We pass it) your Bill lately sent to Us for the settling of the Militia; and, though it hath not been usual to give any Reason for Our Refusal to pass any Bill (it being absolutely in Our Power to pass or not to pass any Act sent unto Us by you, if We conceive it prejudicial to Ourself, or inconvenient for Our Subjects, for whom We are trusted, and must One Day give an Account); yet, in this Business of the Militia, which, being misunderstood amongst Our good Subjects, hath been used as an Argument as if We were not vigilant enough for the Public Safety, and lest We should be thought less constant in Our Resolutions, and this Bill to be the same We sent unto you; We have thought fit to give you and all the World partiticular Satisfaction, why We cannot, ought not, must not, pass this Bill, being the first Public Bill to Our Remembrance We have refused this Parliament: And therefore We must complain, that, having expressed Ourself so clearly and particularly to you in this Point, you should press any Thing upon Us which you could not but foresee that We must refuse, except We departed from those Resolutions, grounded upon so much Reason, We had so earnestly before acquainted you with, and against which you have not given One Argument to satisfy Our Judgement. "We are pleased that you have declined the unwarrantable Course of your Ordinance (to which We are confident Our good Subjects would never have yielded Consent), and chosen this only right Way of imposing on Our People, which We would have allowed but for the Reason hereafter mentioned. "We refused to consent to your Ordinance, as for other Things, so for that the Power was put into the Persons nominated therein by Direction of both Houses of Parliament, excluding Us from any Power in the Disposition or Execution of it together with you. We then advised you, for many Reasons, that a Bill should be prepared; and after, in Our Answer of the Twentysixth of March last, to the Petition of both Houses, We told you, if such a Bill should be prepared, with that due Regard to Us, and Care of Our People, in the Limitation of the Power and other Circumstances, We should recede from nothing We formerly expressed. What passed (enough to have discouraged Us from being further solicitous in that Argument) after Our full and gracious Answers, We are content to forget. When We resolved of Our Journey into Ireland (so that, by reason of Our Absence, there might be no Want of settling that Power), besides complying with your Fears, We sent, together with a Message of that Our Purpose, a Bill for the settling of that Power for a Year, hoping in that Time to return to you, and being sure that in much less Time you might do the Business for which at first you seemed to desire this; which was, that you might securely consider Our Message of the Twentieth of January last: By that Bill, We consented to those Names you proposed in your Ordinance, and in the Limitation of the Power provided, that Ourself should not be able to execute any Thing but by your Advice; and, when We should be out of the Kingdom, the sole Execution to be in you, with many other Things, of so arbitrary and uncircumscribed a Power, that We should not have consented to it, but with Reference to the Absence of Our own Person out of the Kingdom, and thought more sufferable in respect the Time was but for a Year. Whether this be the Bill you have now sent Us to pass, let all the World judge. "You have, by this Bill now tendered to Us (without taking Notice of Us), put the Power of the whole Kingdom, the Life and Liberties of the Subjects of all Degrees and Qualities, into the Hands of particular Men, for Two Years. Can you imagine We will trust such an absolute Power in the Hands of particular Persons, which We refused to commit to both Houses of Parliament? Nay, is not the Power itself too absolute, too unlimited, to be committed into any private Hands? Hath not Sir John Hotham's high Insolency shewed Us what We may expect from an exorbitant legal Power, when he, by a Power not warranted by Law, dares venture upon a treasonable Disobedience? But We would willingly know (and indeed such an Account in ordinary Civility We might have expected) why We are by this Act absolutely excluded from any Power or Authority in the Execution of this Militia. Sure your Fears and Jealousies are not of such a Nature as are capable of no other Remedy than by leaving Us no Power in a Point of the greatest Importance, in which God and the Law hath trusted Us solely, and which We were contented to share with you by Our Bill, by putting it and a greater into the Hands of particular Subjects. What would all Christian Princes think of Us, after We had passed such a Bill? How would they value Our Sovereignty? And yet sure Our Reputation with Foreign Princes is some Ground of your Security. Nay, We are confident, by that Time you have thoroughly considered the possible Consequence of the Bill upon yourselves, and the rest of Our good Subjects, you and they will give Us Thanks for not consenting to it; finding their Condition (had it passed) not to have been so pleasing unto them: We hope this Animadversion will be no Breach of Your Privileges. In this Throng of Business and Distemper of Affections, 'tis possible, Second Thoughts may present somewhat to your Considerations which escaped you before. "We passed this Parliament, at your Entreaty, a Bill concerning the Captives of Algiers, and waved many Objections of Our own to the contrary, upon Information that the Business had been many Months considered by you. Whether it prove suitable to your Intentions, or whether you have not by some private Orders suspended that Act of Parliament, upon View of the Mistakings, you best know; as likewise what other great Alterations you have made in other Bills passed this Sessions. We cannot pass over the putting their Names out of this Bill, whom before you recommended to Us in your Ordinance; it seems, not thinking fit to trust those who would obey no Guide but the Law of the Land (We imagine you would not with We should, in Our Estimation of others, follow that your Rule); and leaving out, by special Provision, the present Lord Mayor of London, as a Person in your Disfavour; whereas, We must tell you, his Demeanour hath been such, that the City and the whole Kingdom is beholden to him for his Example. "To conclude, We do not find Ourself possessed of such an Excess of Power, that it is fit to transfer or consent it should be in other Persons (as is directed by this Bill); and therefore We shall rely upon that Royal Right and Jurisdiction, which God and the Law hath given Us, for the suppressing of Rebellion and resisting Foreign Invasion, which hath preserved this Kingdom in the Time of all Our Ancestors, and which We doubt not but We shall be able to execute; and, not more for Our own Honour and Right than for the Liberty and Safety of Our People, We cannot consent to pass this Bill." The House, taking these Two Messages into serious Consideration, (fn. 3) Resolved, To communicate them to the House of Commons at a Conference. To desire a present Conference (if it may stand with their Conveniency), by a Committee of both Houses, in the Painted Chamber, touching Two Messages received from the King, being of the highest Consequence ever yet received. The Lord Keeper was appointed to deliver the said Two Messages to the House of Commons at this Conference, and desire them to join, that a select Committee of both Houses may be appointed, to consider what is fit to be done upon the said Messages, and report the same to this House: Likewise the Earl of Essex (fn. 4) was to let them know, that this House conceives these Messages proceed from the destructive Counsels and Advice of ill and wicked Counsellors about the King; therefore to desire them, that the Houses of Parliament would speedily take into Consideration the naming of those ill Counsellors; and that some Course may be taken to have them whensoever they are within the King's Dominions, that so they may be brought to condign Punishment. L. Viscount Say & Seale. Ds. Wharton. Their Lordships, or any Five. Upon Information given this Day unto this House upon Oath, "That several Persons have lately, in a tumultuous Manner, fished in the River of Walfleete, and Burnham Water, in the County of Essex, contrary to the Orders of this House, grounded upon a Verdict passed at the Common Pleas Bar, upon full Evidence, in Declaration and Confirmation of the Title of the Right Honourable the Earl of Sussex to the River and Water aforesaid:" It is now Ordered, by the Lords assembled in Parliament, That the Possession of the said River and Water shall be continued unto the said Earl of Sussex, according to the said Verdict, until his Lordship shall, by any legal Proceeding or Order of Parliament, be evicted; and if any Man pretend any Title to the said River, Water, or Fishing, and shall commence a Suit against the said Earl of Sussex in this Cause, his Lordship will appear to the Action, lay by his Privilege of Parliament, and join with him in the said Suit: And lastly it is Ordered, That George Asser, John Poole, Richard Bishopp, William Tompson, Richard French, and Richard Living, mentioned in the Affidavits, that have in such a tumultuous Manner fished in the said River and Water, shall be sent for as Delinquents, to answer their Contempts to the Orders of this House. Upon Information to this House, "That Robert Walsh, Esquire, a sworn Servant in Ordinary to the Queen, did now attend the Pleasure of this House, according to their Lordships Order of the 29th of this Instant April, and humbly desired his Enlargement, being arrested contrary to the Privilege of Parliament:" It is Ordered, That the said Mr. Walsh shall forthwith be freed of and from his present Restraint and Imprisonment. Upon the humble Petition of the Mayor and Aldermen of the Town of Colchester, informing this House, "That there is a Cause now ready for hearing in Chancery, in a judicial Way, between (fn. 5) them and one Freshfeild, who, endeavouring to decline that Proceeding, desires to have his Cause heard here before the Lords in Parliament:" It is thought fit, and so Ordered by this House, in regard the said Freshfeild may have his Remedy in the Chancery, That the Cause be wholly dismissed this House, and left to the Chancery, that the Lord Keeper may so hear, proceed, and determine the said Cause, as may be agreeable to Equity and Justice. Dominus Custos Magni Sigilli declaravit præsens Parliamentum continuandum esse usque in post meridiem hujus instantis diei, videlicet, 30m diem Aprilis, 1642, hora 3a, Dominis sic decernentibus. Ordered, That Henry Roseby and his Wife shall be summoned to appear before this House, on Tuesday the 3d of May next, to answer their great Contempt, for erecting a House upon the King's Ground, contrary to several Orders of this House, and shew Cause why the said Building, so erected in Contempt as aforesaid, shall not be forthwith pulled down; and they to stand committed, for offending against this House, and for their Contempt of the several Orders in this Particular. Ordered, That the Lord Capell shall have Leave to be absent from his Attendance on this House for a Week, his Lady being sick. Ordered, That the Earl of Holland, the Lord Wharton, the Lord Kymbolton, and the Lord Brooke, do prepare an Order, to be sent to the Sheriff and Justices of the Peace for the County of Berks, for preventing all Riots and unlawful Assemblies in the Forest of Windsor, and present the same to this House. 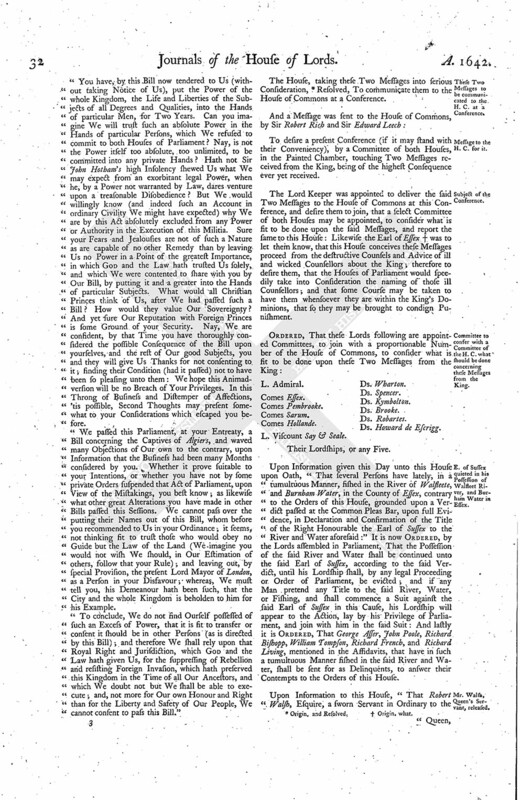 A Message was brought from the House of Commons, by Walter Longe, Esquire, &c.
To let their Lordships know, that the House of Commons do agree in the Matter of the late Conference, concerning the Two Messages from the King, and have appointed a proportionable Number of their Members to join with the Committee of Lords; but desire that the Power of that Committee may be enlarged, to consider of any Thing that concerns the Safety of this Kingdom, and that their Lordships would please to appoint Time and Place where the said Committee shall meet. 2. The House of Commons desires their Lordships would put the Ordinance of both Houses of Parliament, for settling the Militia, into Execution. 3. They desire their Lordships Concurrence in an Order for enabling the Sea Adventurers for Ireland to subscribe Monies, for the Service of that Kingdom. Hereupon this House Ordered, To enlarge the Power of the Committee, as is desired; and that the Committee do meet this Afternoon, when the House rises, in the Painted Chamber, and have hereby Power to adjourn themselves from Time to Time afterwards, and to make Sub-committees, and divide themselves, as they shall see Cause. Ordered, That the Ordinance for settling the Militia shall be put into Execution. Next, the Order for the Sea Adventurers for Ireland was read; and Ordered, To be committed to the Earl of Leycester, the Earl of Bristoll, and the Lord Viscount Say & Seale, Lord Wharton, and Lord Brooke; who are presently to consider thereof, and report the same to this House. That (fn. 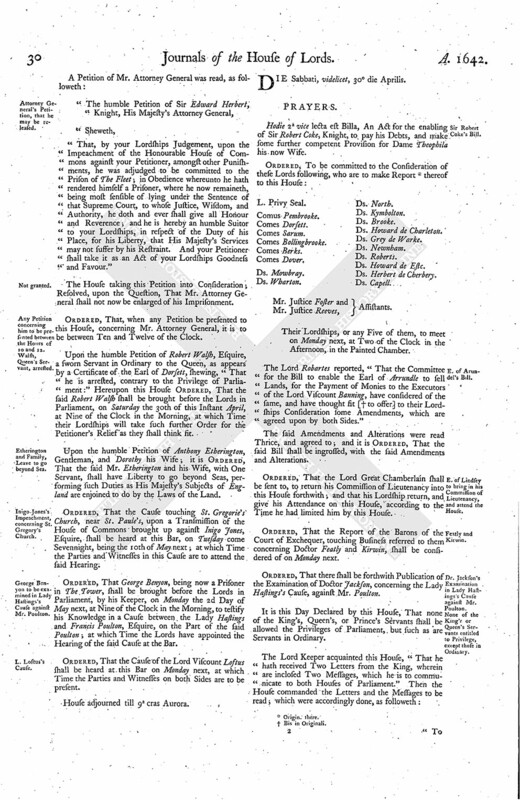 6) this House agrees to the enlarging the Power of the Committee, as is desired, and have appointed the said Committee to meet at the Rising of the House this Afternoon, in the Painted Chamber, and given them Power to divide themselves into Sub-committees, and to adjourn from Time to Time, as often as they shall see Occasion. 2. Touching the Ordinance for the Militia, their Lordships are resolved to put the same into Execution. 3. Concerning the Order touching the Sea Adventurers for Ireland, their Lordships will take the same into Consideration, and send an Answer by Messengers of their own. The Lord Lieutenant of Ireland acquainted this House, "That he hath received divers Examinations from Ireland of some Rebels, which his Lordship is to bring into this House;" also Abstracts of Letters from Ireland were read, concerning Colonel Beeling and the Affairs of Irelande, expressing their Want of Victuals, of Ammunition, Cloaths, Stockings, and Shoes. Ordered, That the Lord Chief Justice of the King's Bench shall call the Witnesses before him, and examine the Business concerning Colonel Beelinge, and make Report thereof to this House; which will give further Order therein. Ordered, That the Trial of the Lord Morley and Mounteagle, touching the Death of Captain Peter Clarke, shall be heard at this Bar this Day Three Weeks, being the 21st of May next; and that the Committee for Privileges shall meet on Monday the 9th of May, and at such other Times as they please between this and the said Hearing, to consider of the Manner and Way of proceeding therein, and to make Report thereof to this House; and hereof the Parties are to take Notice, and give their Attendance accordingly: And lastly it is Ordered, That, upon returning of their Witnesses Names, Warrants shall issue out for their Appearance in the said Cause; and the King's Counsel is hereby required to attend the Committee for Privileges. The Lord Viscount Say & Seale reported, "That the Committee hath considered of the Order concerning the Sea Adventurers for Ireland, and hath offered to their Lordships Consideration some Alterations;" which were read, and approved of. To let them know, that this House agrees to the Order for the Sea Adventurers for Ireland, with the small Alterations, wherein their Lordships desire Concurrence. To inform their Lordships, that, notwithstanding the Dislike both Houses took to the Petition of Kent, yet this Day some have presumed to exhibit that Petition to the House of Commons, for which the House of Commons have committed Sir William Butler to The Fleet, and Captain Lovelace to The Gatehouse; and the House of Commons desires their Lordships, that the former select Committee for the Petition of Kent may be appointed to meet, and receive further Information herein, and examine the said Sir William Butler and Captain Lovelace, and such Witnesses as shall be produced, concerning that Business. 2. The House of Commons desire their Lordships Concurrence in an Order concerning Hull. The said Order was read, and taken into Consideration, and a small Addition made; and it was Resolved, upon the Question, To join with the House of Commons in this Order, with the Addition now read. Ordered, That this House agrees with the House of Commons, for the Examination of Sir William Butler and Captain Lovelace, as they have desired. That this House agrees to the First Part of this Message; and for the Second Part, this House will send an Answer, by Messengers of their own. To let them know, that this House agrees in the Order concerning Hull, with the Amendments, wherein this House desires their Concurrence. 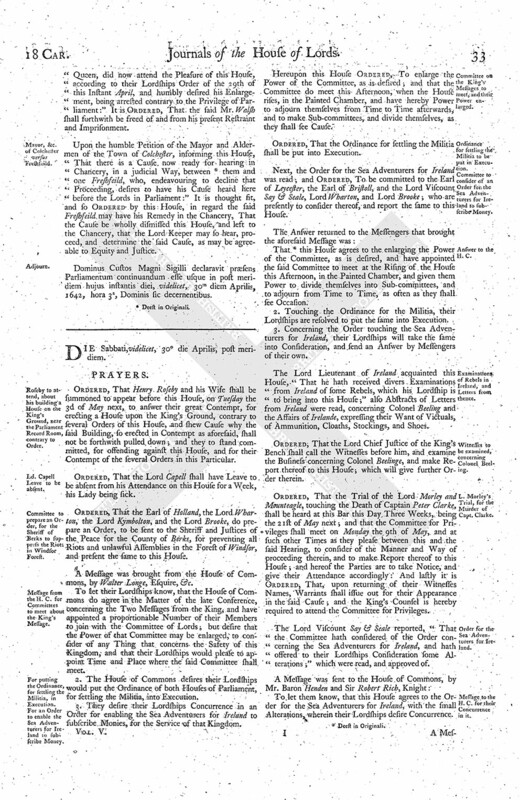 Upon reading of the Petition of Richard Bruton, this Day in the House, touching a Writ of Error between Sir John Lenthall, Knight, and the said Bruton; it is Ordered, by the Lords in Parliament assembled, That the Errors and Diminution touching the said Writ shall be argued at the Bar on Thursday, being the 5th of May next; and that the Judges be desired to be then present, and the Parties are likewise to attend, with their Counsel. Ordered, That Hugh Reeves, Clerk, late Parson of Ampthill, in the County of Bedford, shall avoid the House he now dwelleth in, within One Month's Warning after he shall be served with this Order, according to a former Order of this House, dated the 23d of February 1640; or else that the Ten Pounds per Annum then conferred upon him shall be withheld and disposed of, as the Lord Bruce shall think fit. To let their Lordships know, that they do agree to the Order concerning the Sea Adventurers for Ireland, with the Alterations made by their Lordships; and likewise they do agree to the Alterations in the Order concerning Hull. 2. They desire a Conference, so soon as it may stand with their Lordships Conveniency, by a Committee of both Houses, concerning a Declaration to be sent into Yorkshire, touching the raising of the Trained Bands in that County. 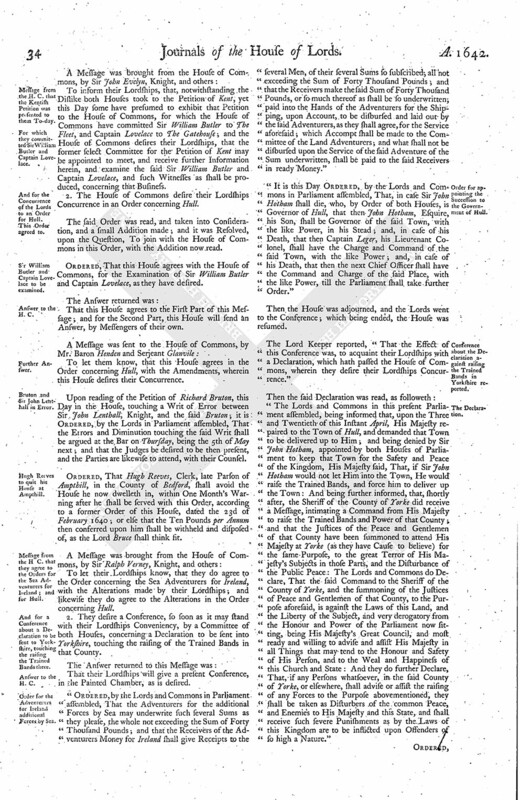 "Ordered, by the Lords and Commons in Parliament assembled, That the Adventurers for the additional Forces by Sea may underwrite such several Sums as they please, the whole not exceeding the Sum of Forty Thousand Pounds; and that the Receivers of the Adventurers Money for Ireland shall give Receipts to the several Men, of their several Sums so subscribed; all not exceeding the Sum of Forty Thousand Pounds; and that the Receivers make the said Sum of Forty Thousand Pounds, or so much thereof as shall be so underwritten; paid into the Hands of the Adventurers for the Shipping, upon Account, to be disbursed and laid out by the said Adventurers, as they shall agree, for the Service aforesaid; which Accompt shall be made to the Committee of the Land Adventurers; and what shall not be disbursed upon the Service of the said Adventure of the Sum underwritten, shall be paid to the said Receivers in ready Money." "It is this Day Ordered, by the Lords and Commons in Parliament assembled, That, in case Sir John Hotham shall die, who, by Order of both Houses, is Governor of Hull, that then John Hotham, Esquire, his Son, shall be Governor of the said Town, with the like Power, in his Stead; and, in case of his Death, that then Captain Leger, his Lieutenant Colonel, shall have the Charge and Command of the said Town, with the like Power; and, in case of his Death, that then the next Chief Officer shall have the Command and Charge of the said Place, with the like Power, till the Parliament shall take further Order." Then the House was adjourned, and the Lords went to the Conference; which being ended, the House was resumed. The Lord Keeper reported, "That the Effect of this Conference was, to acquaint their Lordships with a Declaration, which hath passed the House of Commons, wherein they desire their Lordships Concurrence." "The Lords and Commons in this present Parliament assembled, being informed that, upon the Three and Twentieth of this Instant April, His Majesty repaired to the Town of Hull, and demanded that Town to be delivered up to Him; and being denied by Sir John Hotham, appointed by both Houses of Parliament to keep that Town for the Safety and Peace of the Kingdom, His Majesty said, That, if Sir John Hotham would not let Him into the Town, He would raise the Trained Bands, and force him to deliver up the Town: And being further informed, that, shortly after, the Sheriff of the County of Yorke did receive a Message, intimating a Command from His Majesty to raise the Trained Bands and Power of that County; and that the Justices of the Peace and Gentlemen of that County have been summoned to attend His Majesty at Yorke (as they have Cause to believe) for the same Purpose, to the great Terror of His Majesty's Subjects in those Parts, and the Disturbance of the Public Peace: The Lords and Commons do Declare, That the said Command to the Sheriff of the County of Yorke, and the summoning of the Justices of Peace and Gentlemen of that County, to the Purpose aforesaid, is against the Laws of this Land, and the Liberty of the Subject, and very derogatory from the Honour and Power of the Parliament now sitting, being His Majesty's Great Council, and most ready and willing to advise and assist His Majesty in all Things that may tend to the Honour and Safety of His Person, and to the Weal and Happiness of this Church and State: And they do further Declare, That, if any Persons whatsoever, in the said County of Yorke, or elsewhere, shall advise or assist the raising of any Forces to the Purpose abovementioned, they shall be taken as Disturbers of the common Peace, and Enemies to His Majesty and this State, and shall receive such severe Punishments as by the Laws of this Kingdom are to be inflicted upon Offenders of so high a Nature." Ordered, That this House agrees with the House of Commons in this Declaration, as it is now brought up. The Lords in Parliament have thought it sit to command the Earl of Holland's Attendance upon Monday next, for the Affairs of His Majesty and the Kingdom, here in Parliament; and therefore they do, by this Order, direct the Sheriff of Berks, and the Officers of the Forest of Windsor, that (as Chief Justice, and Justice in Eyre, and as Constable of Windsor) the said Earl had appointed to attend him at Egham upon Monday next, being the 2d Day of May, That they shall be careful to inform themselves of the Riots and Disorders that have been of late in that Forest, it being a Blemish to Government, and of a dangerous Consequence in the Example of it, thus to violate and deface His Majesty's Parks and Forests. Upon the humble Petition of the Parishioners of Ackcliff, in the County Palatine of Durham; it is Ordered, That Mr. Daniell Carradine shall not be disturbed, molested, or dispossessed of his lawful Possession, of officiating in the Vicarage of Ackcliff aforesaid, by George Leeke, Clerk, until the Difference between them be heard and determined in this House, or in some other legal Way of Proceeding; and lastly, that the said Mr. Leeke shall, forthwith after the serving of this Order upon him, appear before the Lords in Parliament, to shew Cause why he hath violently thrust out the said Mr. Carradine out of his Possession of officiating in the Vicarage of Ackcliff aforesaid. This Day the Bill concerning the Executors of the Lord Viscount Banning, deceased, was reported from the Committee, as fit to pass, with some Amendments; which being read, were approved, and the Bill Ordered to be ingrossed, according to the Amendments. Dominus Custos Magni Sigilli declaravit præsens Parliamentum continuandum esse usque in diem Lunæ, videlicet, 2m diem Maii, 1642, hora 9a Aurora, Dominis sic decernentibus.